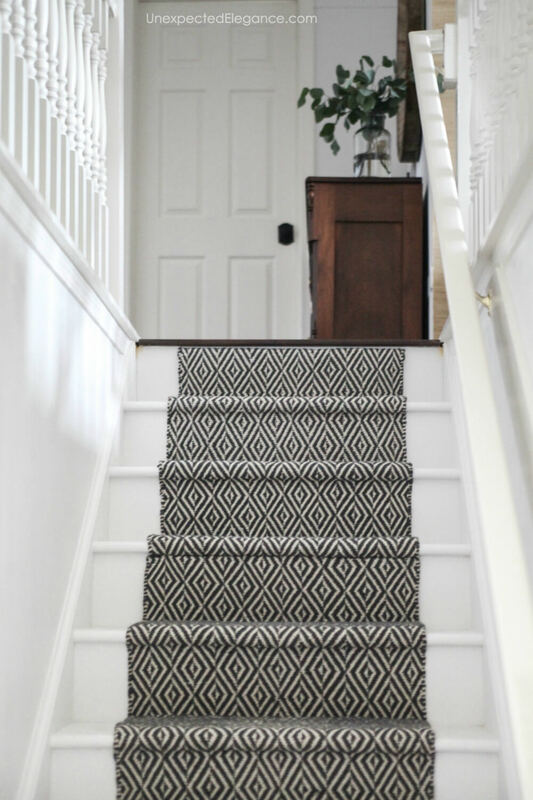 Check out this tutorial on how to replace your outdated carpet with an inexpensive stair runner. 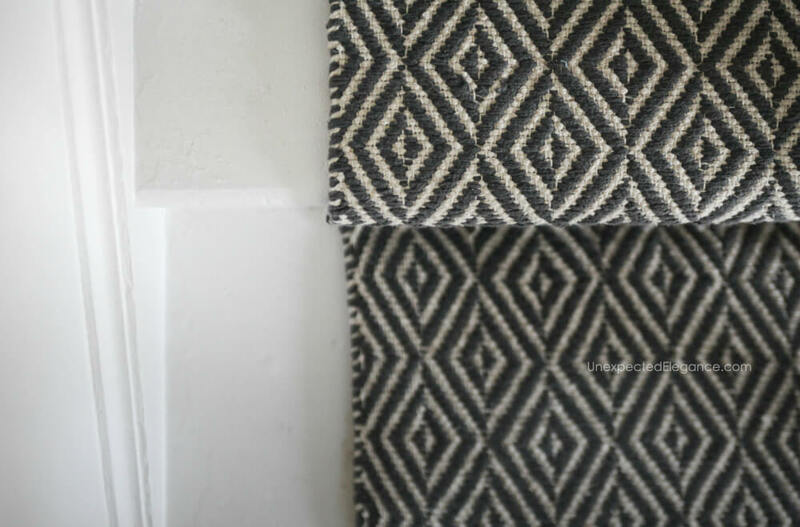 I’ve been anxious to share this inexpensive stair runner project I just completed last week. These stairs have needed a makeover for a while! We moved into our house 9 years ago and replaced the carpet and painted…but we hadn’t touched that part of the house since then. To say it was time for an update would be an understatement. Here’s what it looked like BEFORE. It was a toupe frieze carpet with yellowish colored walls and cracked paint around all the trim. 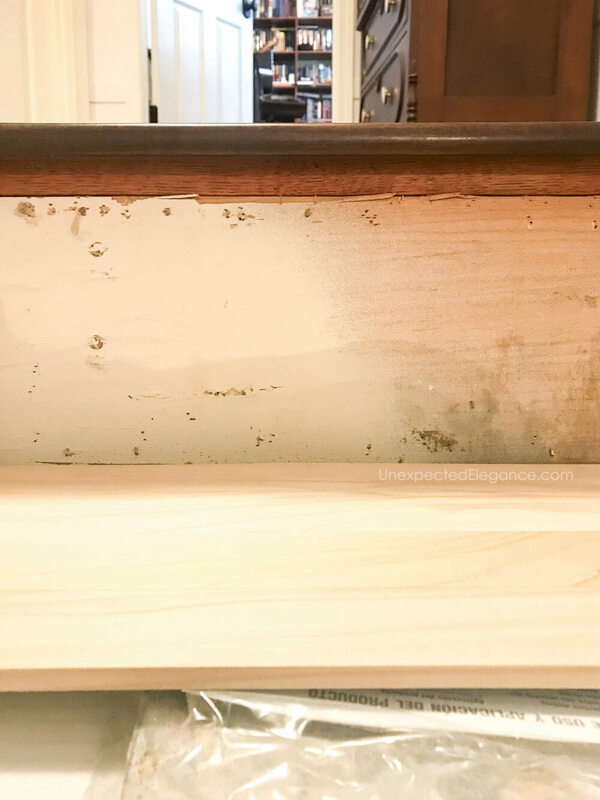 My husband doesn’t handle home construction very well, so I knew this project wouldn’t go over well…especially considering we NEED to go up and down the stairs. I’d been waiting for him to go out of town, so I could start this! I gave him a heads up, but he told me I needed to finish it before he got home from his business trip. Did mention he was only gone for a little less than 2 days?!? 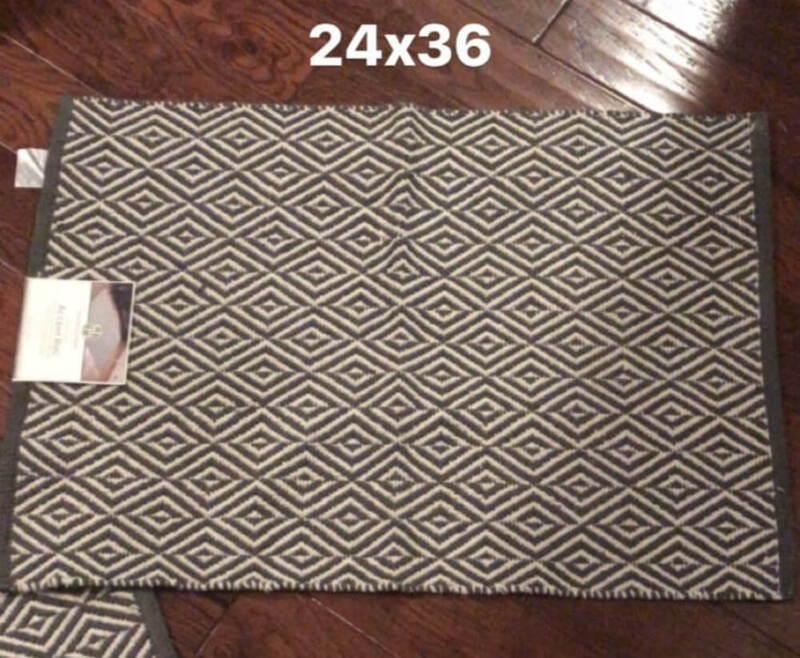 The specific rugs I used were small 2’x3′ size from Aldi that I found for $3.99 each. I can’t link to those, but I did find this one. 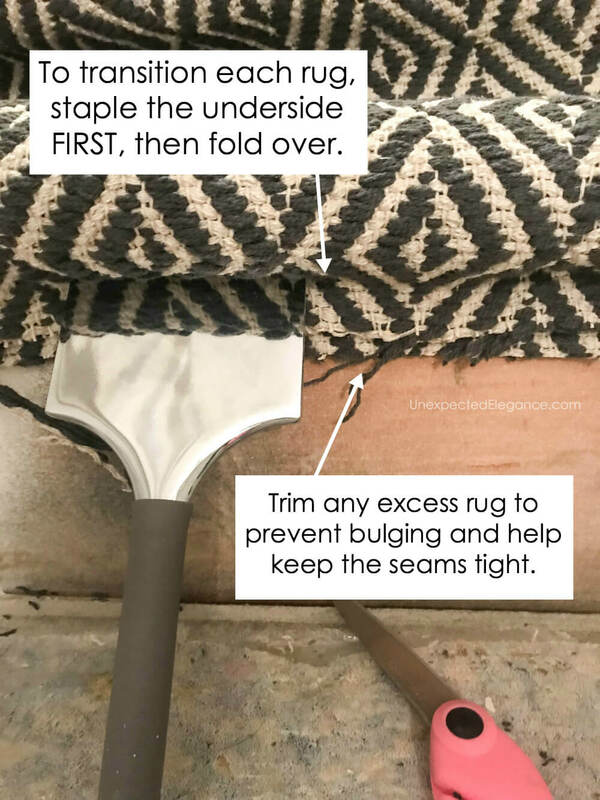 Honestly, a longer rug will be much easier to use because you’ll have to hide fewer seams. They come in different lengths, but make sure you purchase more than you “think” you’ll use! The paint I used was Pittsburgh Paints & Stains® Paramount™ in Arctic Cotton. I LOVE this paint because it goes on smooth and only requires touch ups-not a second coat! I ripped out all the old carpet first. It was simple to pull up, but was a little bit of a workout! Removing it was easy compared to all the prep work that came afterward. 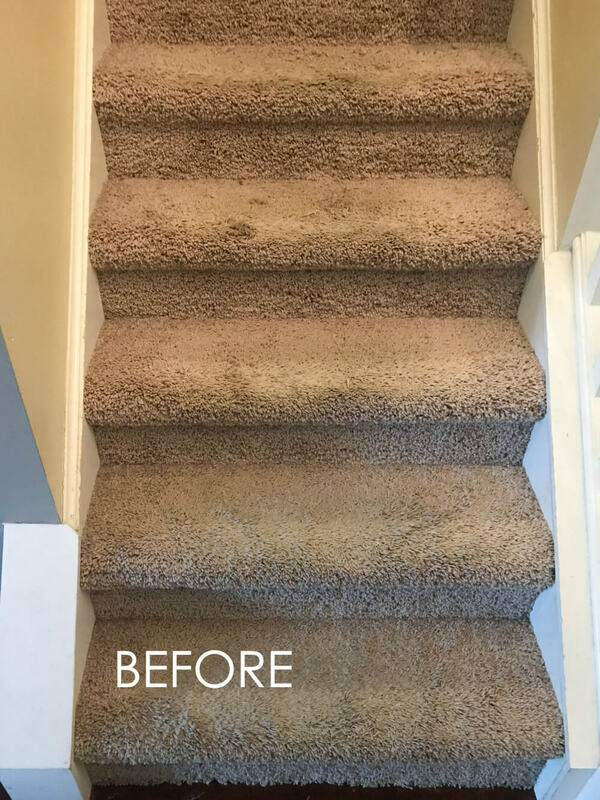 Once the carpet was gone, there were a bazillion staples and a tack strip on each stair tread. It took me several hours to get all the staples, but you want to make sure there are NONE left. Note: Use a prybar and hammer to get up the strips easily, then pliers to remove the staples. It’s important to have a pad under the rug, so to save some time and money I just trimmed the pad that was already there. 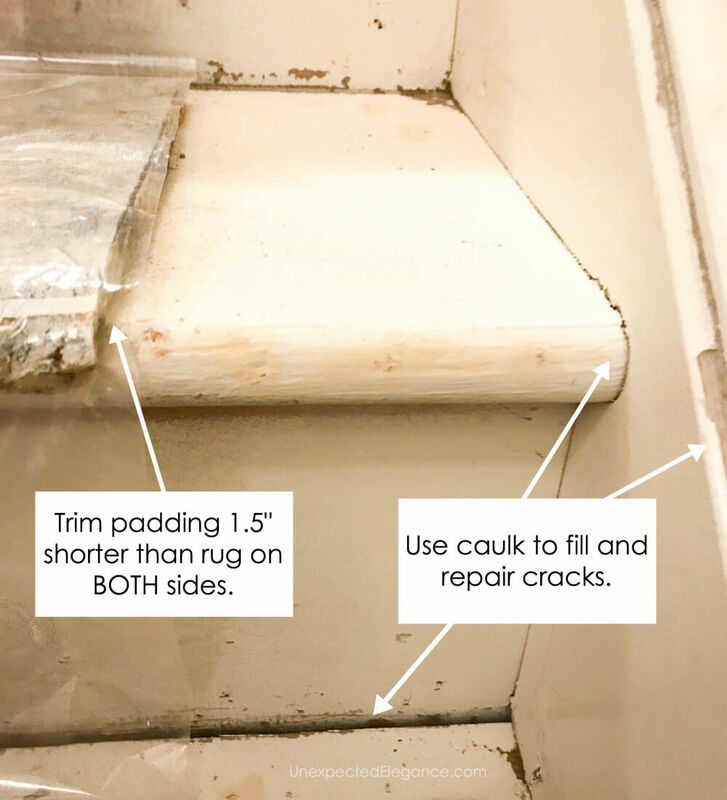 I found the center of the step and then measured out how much pad needed to stay. Using a straight edge, I made lines to show where the pad needed to cut and used scissors to remove the excess. I purchased a pre-made riser that I just trimmed. I was a very easy fix! I started at the top of the stairs since that is where your eye tends to look first. To attach the rug I stapled the underside first, then folded it over to hide the staples and edge of the rug. This is also how I transitioned each new rug. I used the carpet tool, you see in the photo above, to hold the rug in place while I stapled. The tool created a tight and crisp seam. 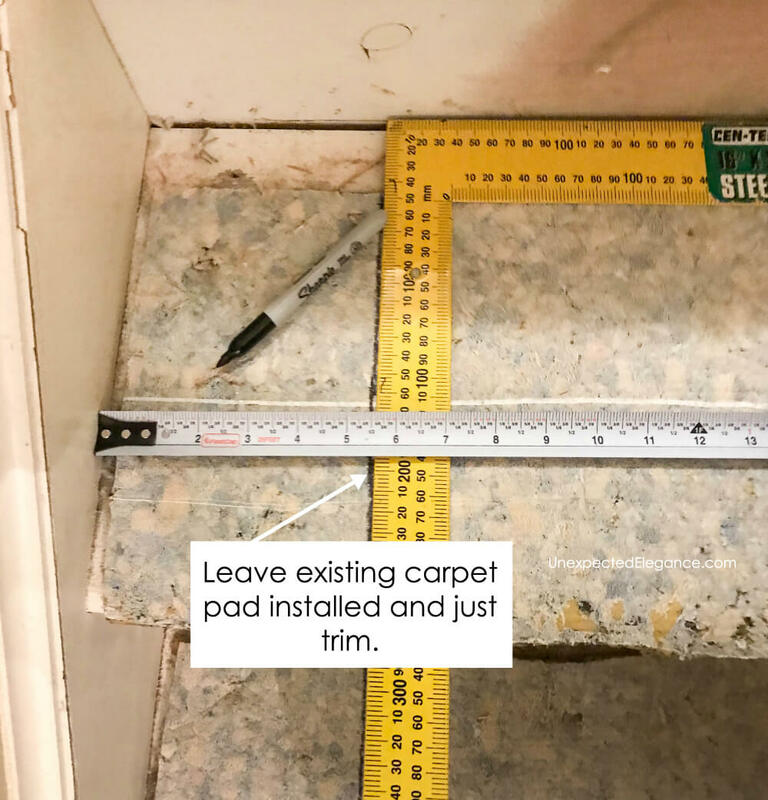 Measure before attaching the rug every time…this will keep it centered. 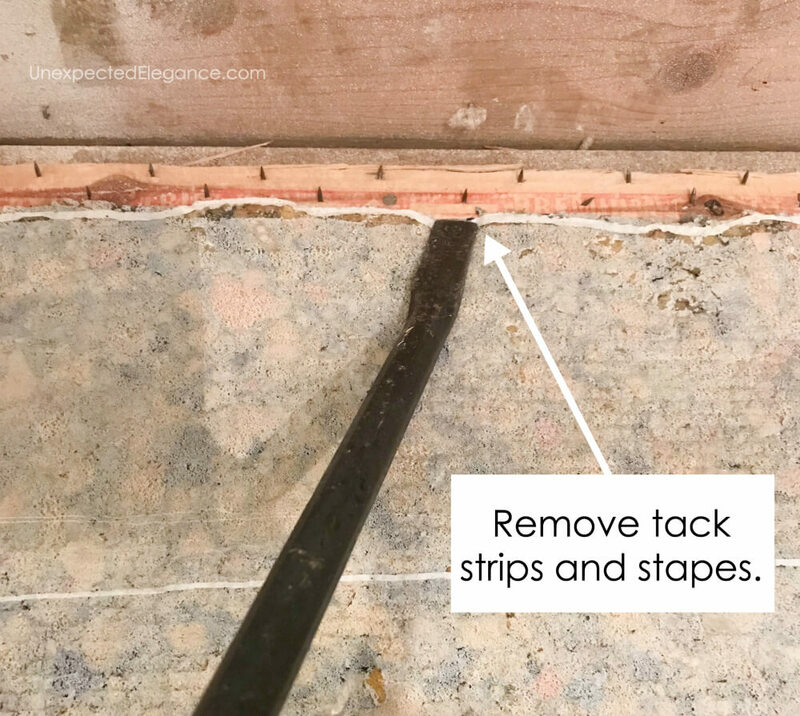 Try to create a straight line with the staples when you are transitioning to a new rug. USE AN ELECTRIC STAPLER IF POSSIBLE! I used a manual one and it was so much more work. 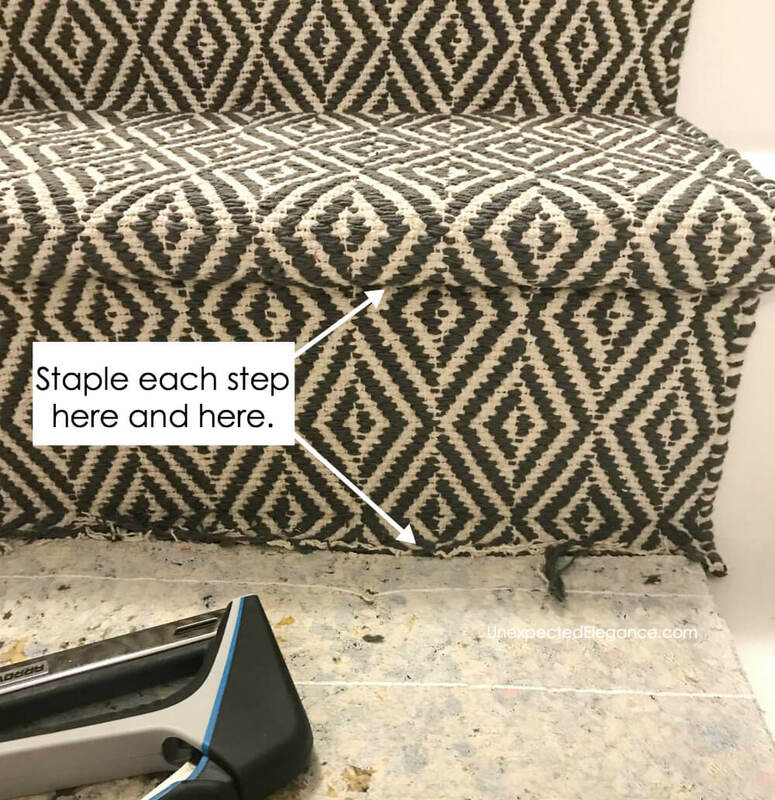 As you go, hammer down all the staples on each step so they are flat. You don’t want anything sticking up. If I have forgotten anything or you have questions, please feel free to ask in the comments below and I will do my best to answer quickly! I had all the other supplies already. It looks fabulous. Love the carpet you chose and it really looks amazing. Great tutorial too. I’ll be taking a break from any labor-intensive projects for a while! Thanks for this wonderful post. Your steps/runner looks amazing. Love runners! I think they’re so beautiful and fill the house with style! How are these holding up? We have problems with the carpet being too loose on our stairs. I’d love to try this, but I’m not sure i could get teh carpet tight enough! It is holding up great!! The most important step is to keep the carpet pad. My only suggestion would be to spend the extra $20 on an electric stapler or borrow one from someone. Beautiful. Love Aldis. Such good prices and good quality for the price for household items. Beautiful! What did you use for the landing at the bottom? What a beautiful look. You did an awesome job and not an easy one, I might add. 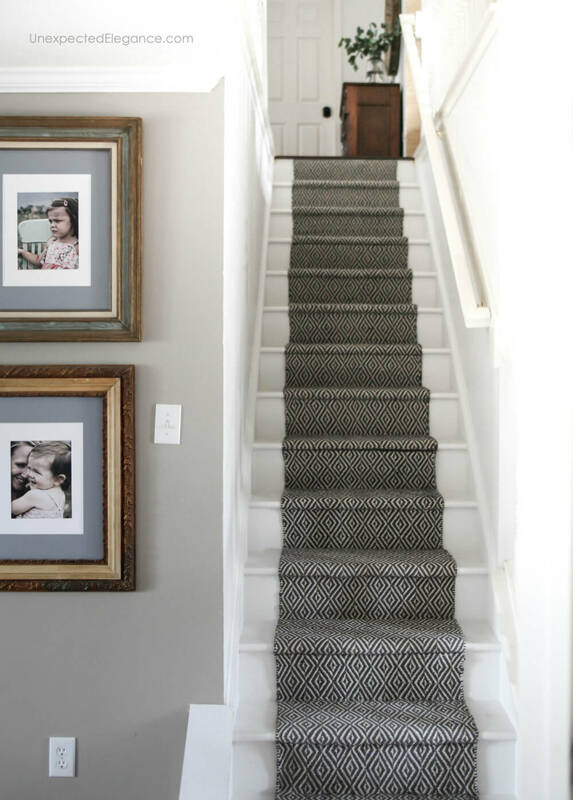 My daughter had her stairs carpeted in runner style and in a similar design. It turned out beautiful too but I think yours look like they lay better around curve. Looking at yours , I think she overpaid by a few thousand! Great job! Thank you for your post. You did such a fantastic job!!!! Love the new rug pattern- so classic!